Note: This is Part 2 of our blog feature on the growing Technology First movement. Here is Part 1. So you’ve decided to be Technology First. Now what? Every service provider has a system of policies and practices that determine how they support people. In most cases, these policies will need to be updated or adapted to support the Tech First approach. Below are a few questions you can use to get started and evaluate how you might start moving in the direction of being a Tech First organization. Outcomes: How will you implement technology as a natural support rather than an add-on feature? Technology should be connected to – and have a direct impact on – the outcomes that have been identified as part of person-centered planning. Infrastructure: What will you include in your Technology Plan so that the organization is prepared to become Tech First? Do you need to update your policies and procedures? What will staffing patterns look like? How will your approach to service planning change? Assessment: How will your approach to assessments change? Does your assessment tool evaluate the environment, the person, and current direct/natural supports? Does your technology vendor offer resources to support the assessment process? Service Planning: How will technology be integrated into the ISP? How will you measure the impact of technology on the outcomes listed in the plan? Roles and Responsibilities: What responsibilities might be reallocated in order to support the technology (responding to alerts, for example)? Who will be your organization’s Tech Champions? Organizations are most successful when there is a team of staff members who embrace the integration of technology as a natural support. Education: How will you educate everyone on technology? Can you access online educational opportunities for each layer of your organization? Will you need additional resources to train people on using the technology, including the individuals, families, and community partners? Funding: What is your organization’s funding strategy for technology integration? Many organizations find that a person-centered approach to technology integration is very sustainable and cost-effective, but initially may require some transition planning in terms of how funding is allocated. Even if your organization has grant funding for a pilot program, sustainable tech integration requires long-range planning. More information about funding here. When it comes to implementing technology as a natural support to an individual, there are at least three approaches. It’s important for the individual and their service planning team to discern together what is the best fit for each situation. The person has self-determined the choice to transition to a supported living setting while demonstrating skills and readiness. (Carl’s story is a good example of this.) The individual is also open to support from technology. The move and the technology integration occur at the same time. Note: This approach can be overwhelming if the individual is not fully ready, if the individual is not open to technology-based supports, if the support staff is not aware of the plan, or if people are not trained to use and respond to the technology. The person has self-determined the choice to live in a supported living setting and would benefit from additional skill development prior to reducing current staff support. 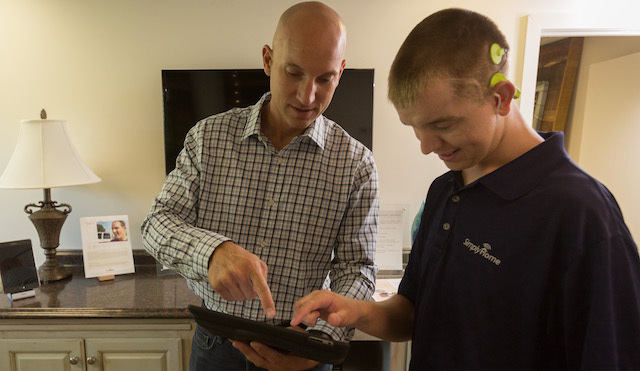 Technology is integrated gradually with small steps and/or is utilized in the current residence before the individual transitions to the new supported living environment. The benefit of this approach is that individuals have time to gain skills and confidence. Technology becomes familiar while the individual is still living in a familiar environment with familiar staff supports. Laura and Vicki’s story is a great example of a stepped transition. Watch their story here. Sometimes, technology is integrated into other environments prior to the community supported living setting. The person has access to technology for navigating their community activities, transportation, and/or a work environment. After developing a comfort level, other technologies may be introduced to support independence in the home. 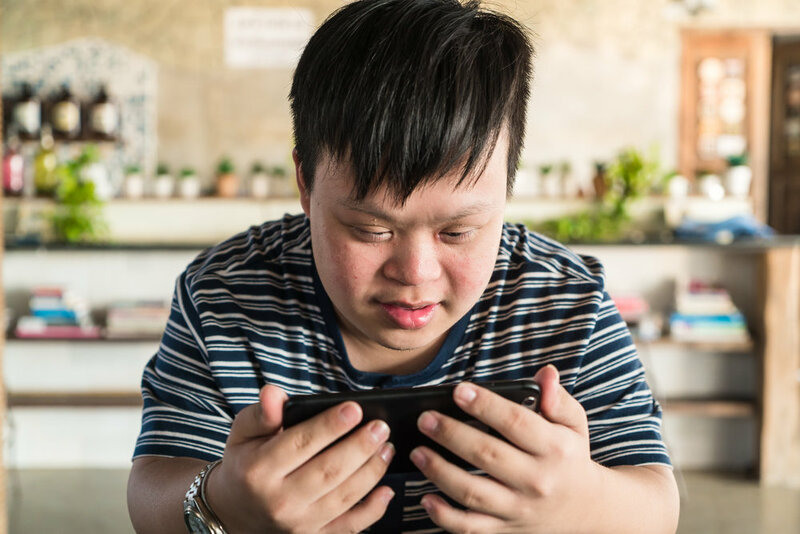 Sometimes, the person may even self-advocate for technology at home after being introduced to it in the community. Ready to learn more? SimplyHome’s Education & Consultation services empower organizations to make technology a natural part of their services. Request more info here.